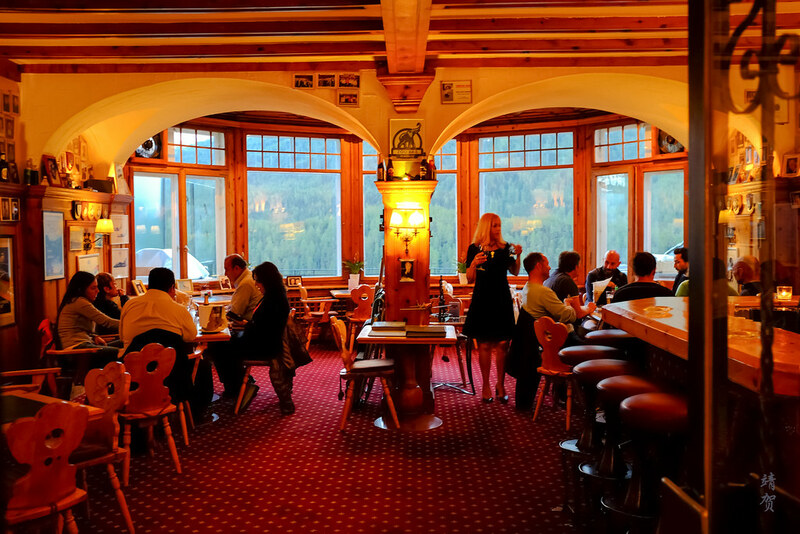 From Davos, I planned to return to Milan and made a stopover in St. Moritz. This was my second visit to this Alps Winter Playground and my first time in Summer. A wonderful weather meant it was a nice drive via the Fluela pass, otherwise, visitors can take the Glacier or Bernina Express train between both ski resorts. Hotel Soldanella is located near the roundabout in the center of town. 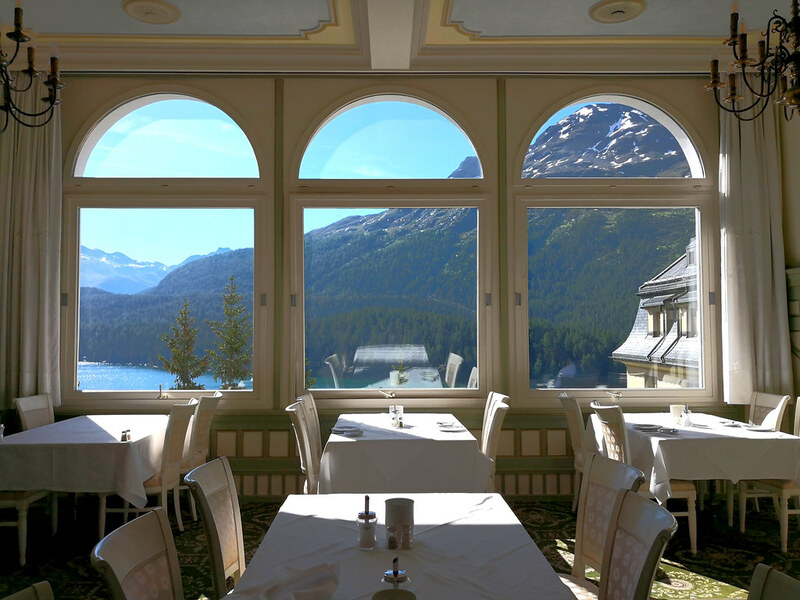 It is probably a 10-15 minute walk up hill to the funicular station to the ski area so it is not exactly the best location to be in St. Moritz. However it is in a quiet area with little distractions and there are some benefits from staying here as I will elaborate in this review. Outside the hotel there are several parking lots on a first-come/first-served basis for hotel guests, otherwise guests who drive would need to find other streetside parking of park at the public parking garage. During the low season, it was no problem for me to find a parking space here. And after unloading my luggage, I went to check-in for my room. 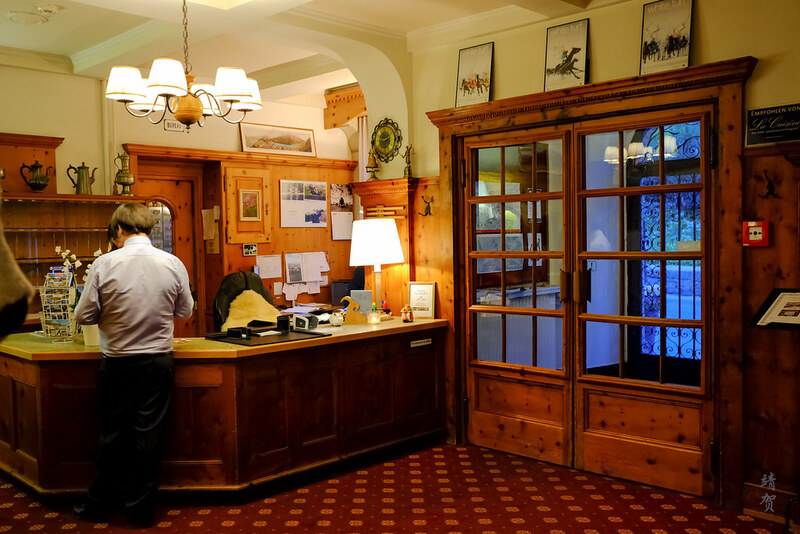 As a small hotel, the lobby has limited seating space and would be chaotic if large groups were to check in at once. However like many small hotels, the reception was friendly if not very enthusiastic since this was during the low season. 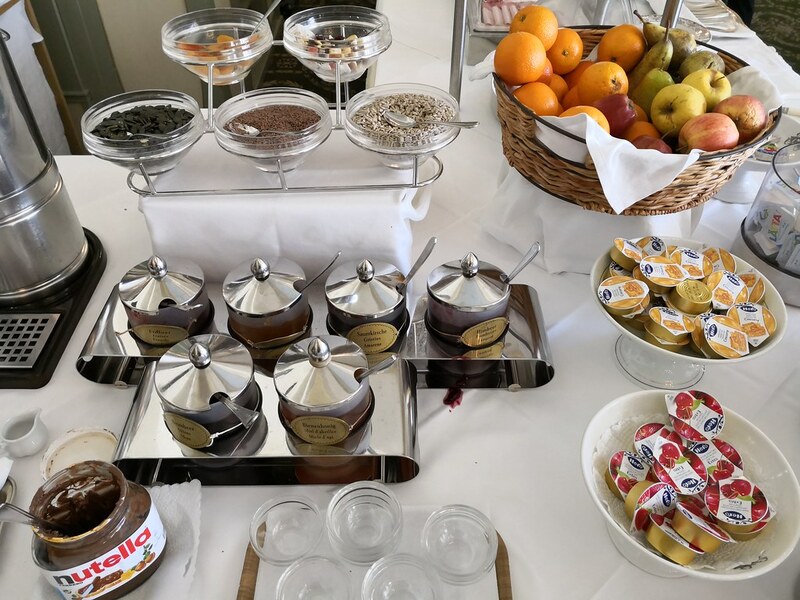 There was not much else to mention except the breakfast included in the rate with it being served in the hotel’s restaurant located on the lower ground floor, with the lobby located on the ground floor and rooms located above. 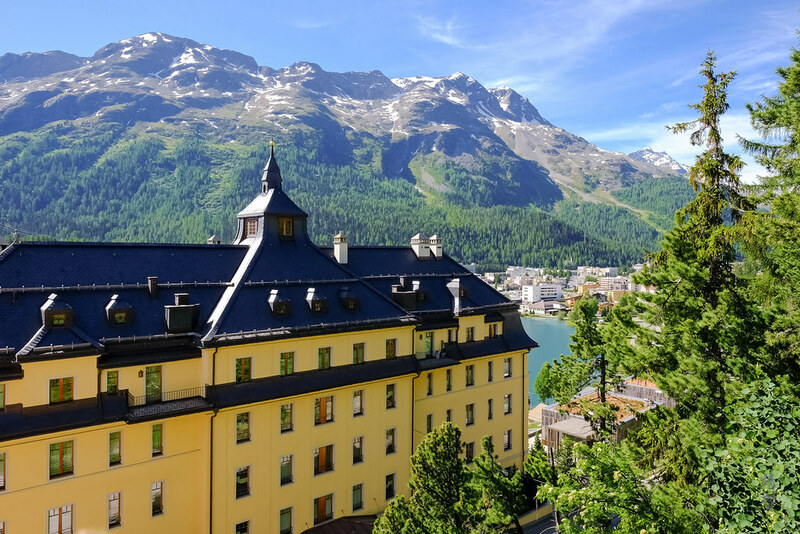 During the low season, there are limited rooms in St. Moritz and the Soldanella is one of the few properties that are open and with a triple room availability as I had required a room for 3 people. Being not a member of any hotel chain, I booked this hotel through one of the online travel agents. 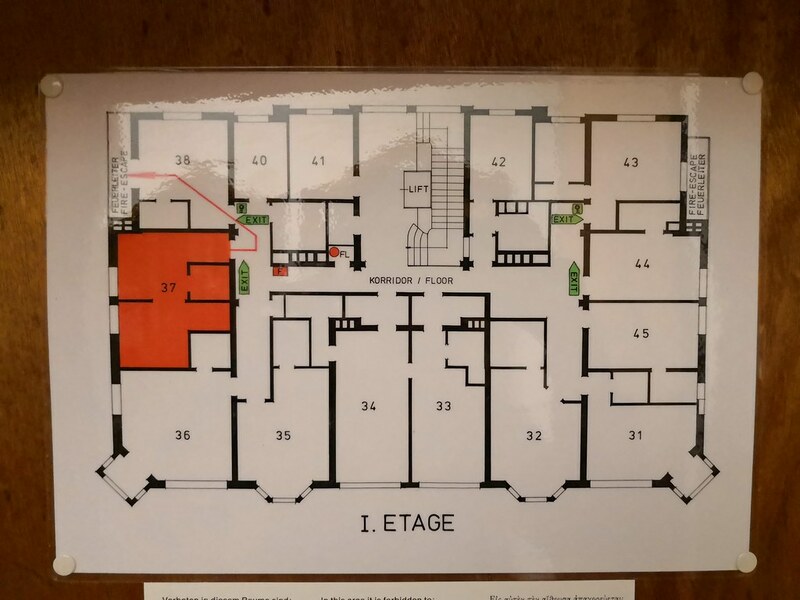 Our assigned floor was just one floor above and guests could either take the stairs that provide access to all the floors or the elevator. 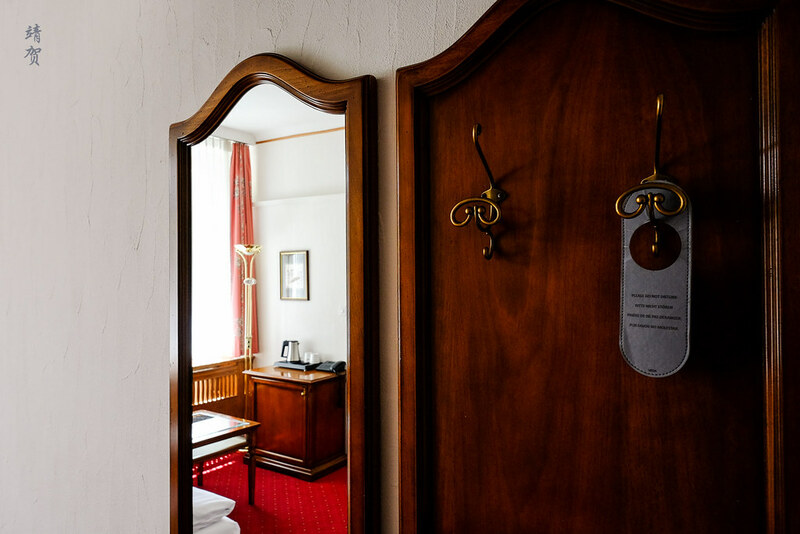 As an old-world hotel, the elevators needs guests to open and close the doors manually, though they are activated only upon the carriage reaching and stopping your assigned floor. From the floor, plan, the Triple Room is separated into 2 sections and this made it larger than the normal ones. Like any good ski hotels, there are large hangers for guests to hang their winter coats and jackets upon entry. 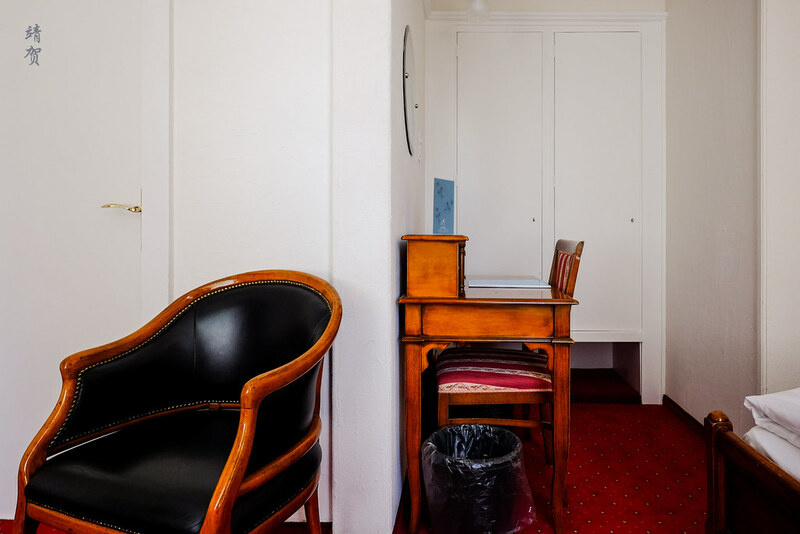 As a triple room, there was a single bed facing the door with a square side table beside and a minibar cabinet by the wall. The bathroom is located across from the minibar and it was easily the smallest and forgettable part of the room. Basic in functionality and design, there was a bathtub for the shower area with shower curtains, toilet and freestanding washbasin. 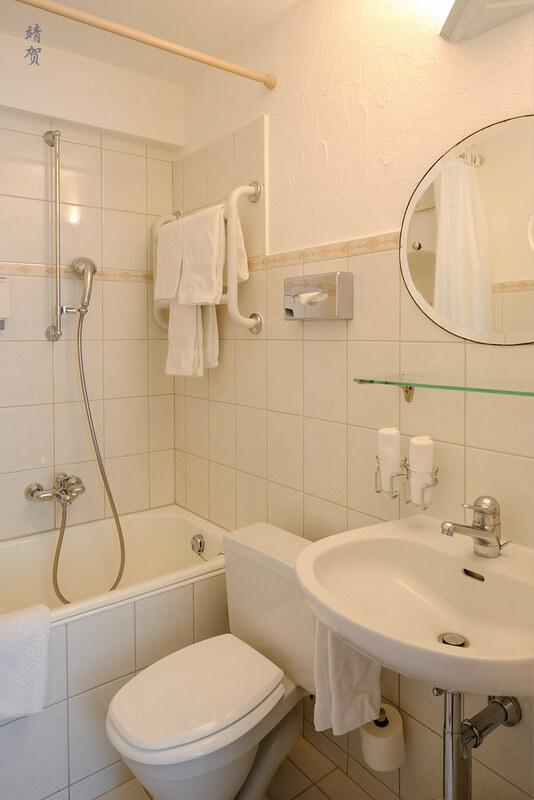 A glass shelf sits above the washbasin and below the mirror to place your toiletries but there was limited space in the shower area, so it was not exactly the best bathroom. 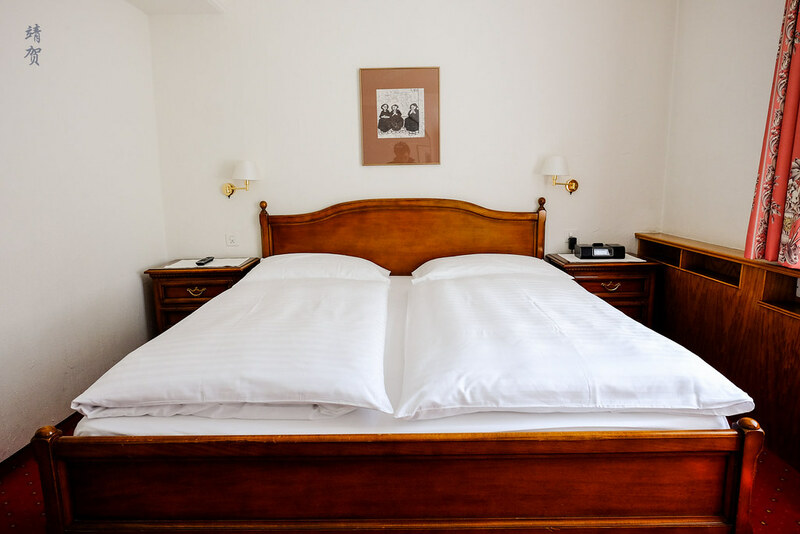 A Queen sized bed is found in the second section of the room with bedside tables on both sides of the bed. Even though the furnishings in this room are old, there was an iPhone/iPod dock and conveniently placed power outlets beside the bed. Besides the bed, there was a writing desk and a closet located in the alcove. There was a standard wooden chair behind the desk. And by the desk was a lone armchair which seems to be out of place and added to the room as an afterthought. While the room was old, I appreciated that it was bright and clean when we arrived. There was a little bit of a musty smell but that happens in older hotels. The classic decor certainly needs some refurbishment but it is fine for guests who are not picky. Because the room has a pretty beautiful lake view with the majestic Swiss Alps behind. By day or night, this view certainly counts for something in one of the sunniest skiing spots in the European Alps. 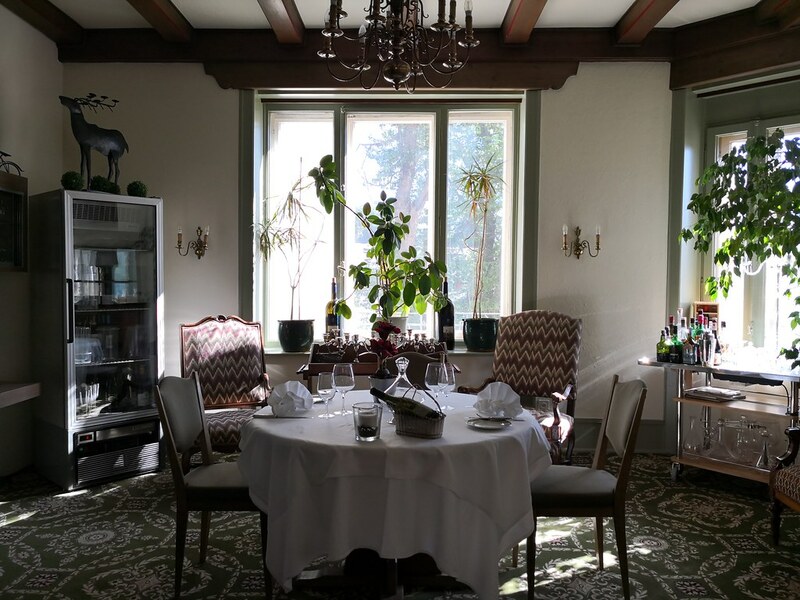 Located one floor below the lobby, the restaurant faces the lake and has large windows allowing the morning sunrise to brighten up the main dining room. This is because the hotel is located on the side of the cliff and thus the lower levels actually leads to the lower streets in the town. 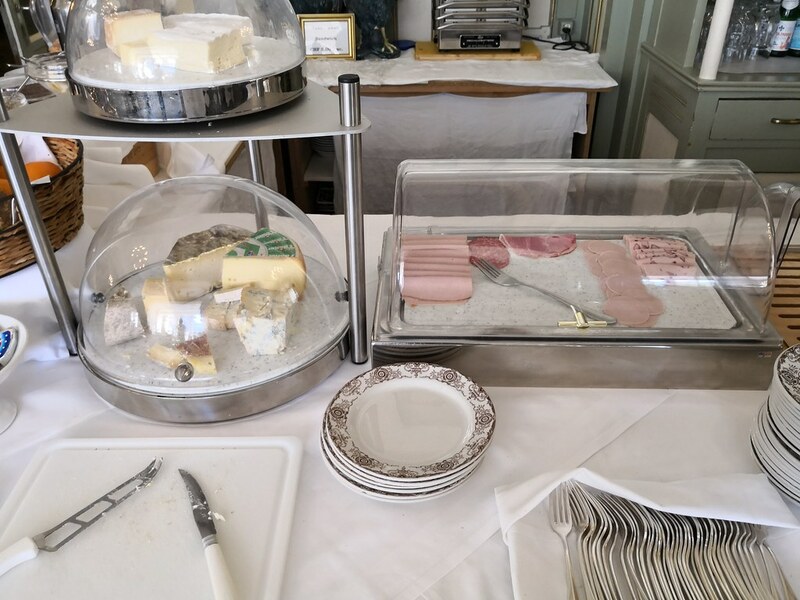 A basic continental buffet breakfast was served in the restaurant. The buffet counter was in an L-shaped table and starting at the end with the cereal, there was 6 kinds of choices with a gluten-free cereal. 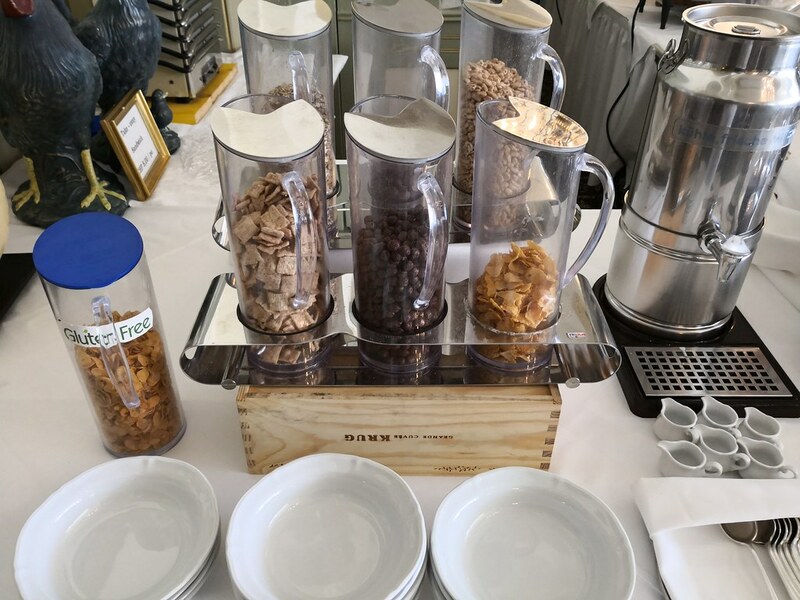 Beside the cereals was several containers serving dried fruits, seeds and nuts along with jars of honey underneath, a big bottle of Nutella, small packets of preserves and honey and a basket of fresh fruits. Past the L-corner, there is the cheese and cold cuts selection. 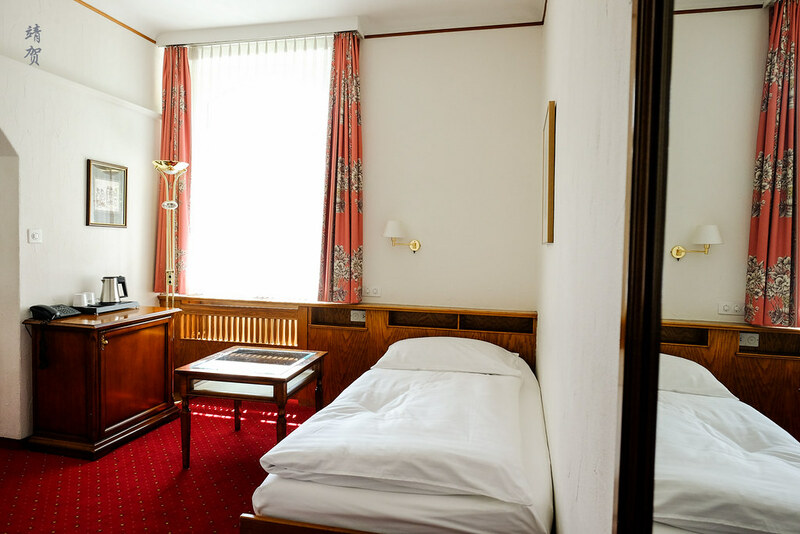 As a Swiss hotel, the variety was somewhat limited and unappealing. 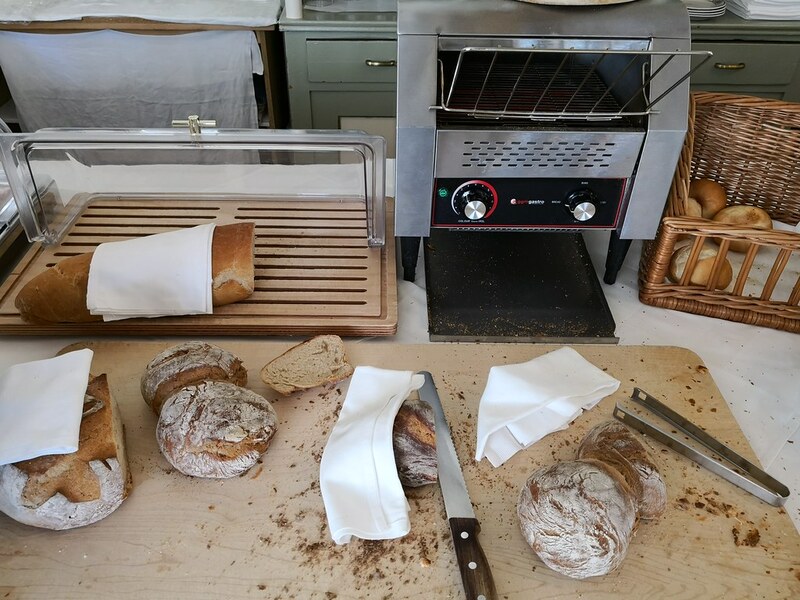 Next to the cold cuts were the bread and pastries section. 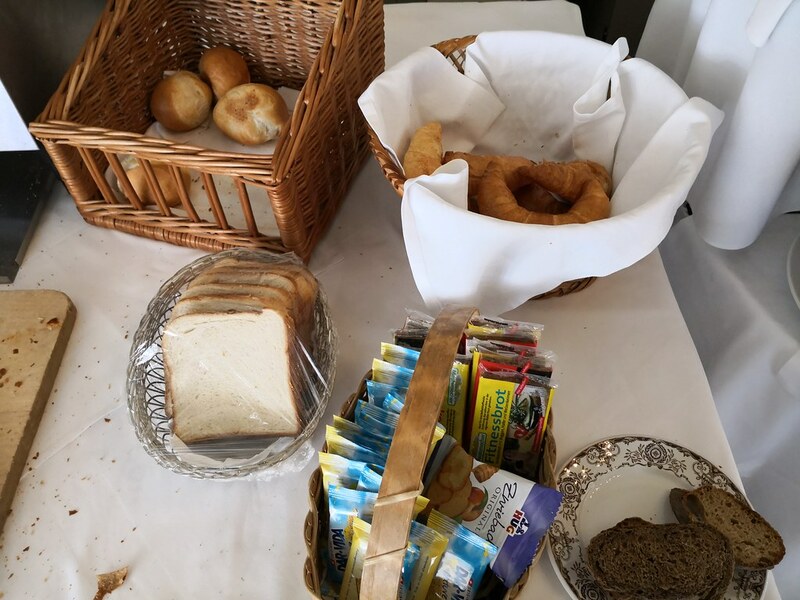 There was baguette, breakfast rolls, white bread and packaged biscuits for guests to take. Fluffy croissants are available from the basket. Since it was breakfast, we cannot forget eggs. 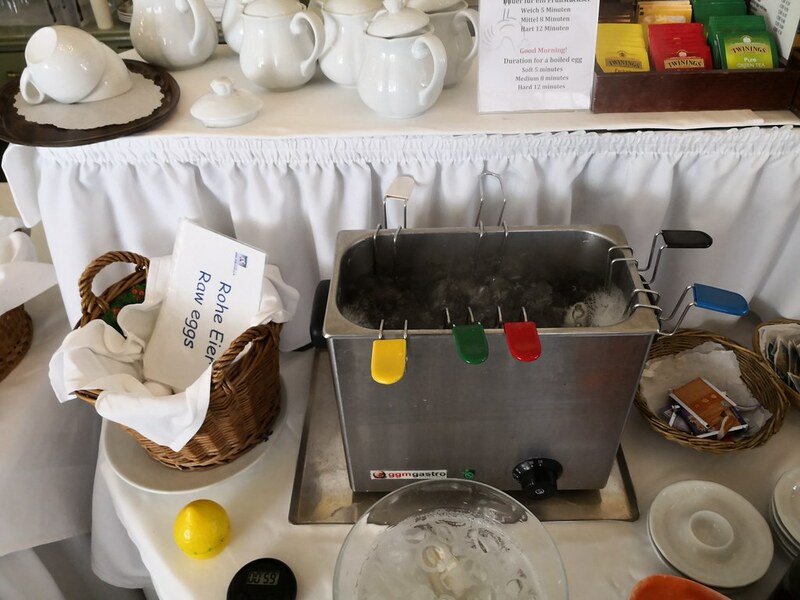 Here guests could grab eggs, place them in colour coded holders and dip them in the boiler so guests can self time to make boiled eggs to their own liking. 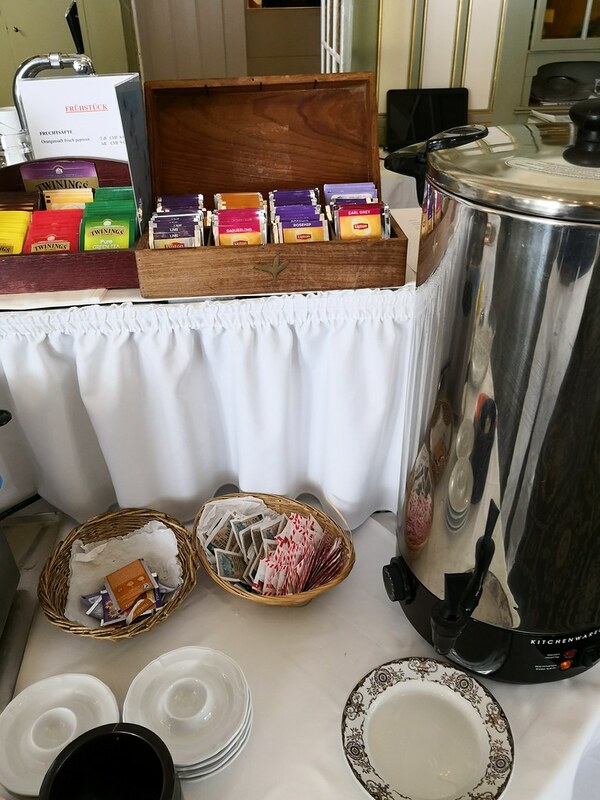 For beverages, brewed coffee was offered by the server and there was Twinnings or Lipton tea bags from the buffet. 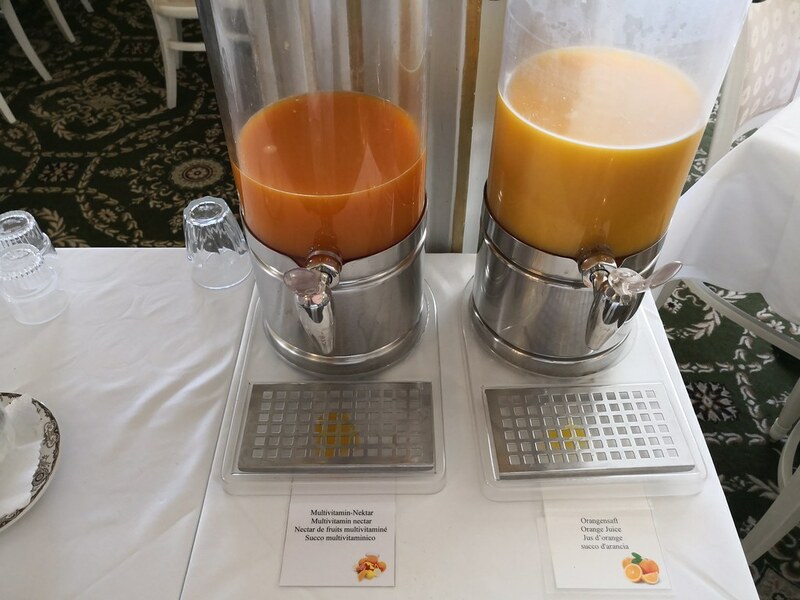 Again the choices for juices was limited to multivitamin or orange. Juices were not very cold either so beverages for breakfast was fairly disappointing. With a lack of presentation, much of the food on the breakfast was unappetizing and the selection was mediocre. This is perhaps one of the reasons I do not particularly enjoy hotel breakfasts. It is much more satisfying to just get a croissant and a cup of cappuccino from a cafe in town. 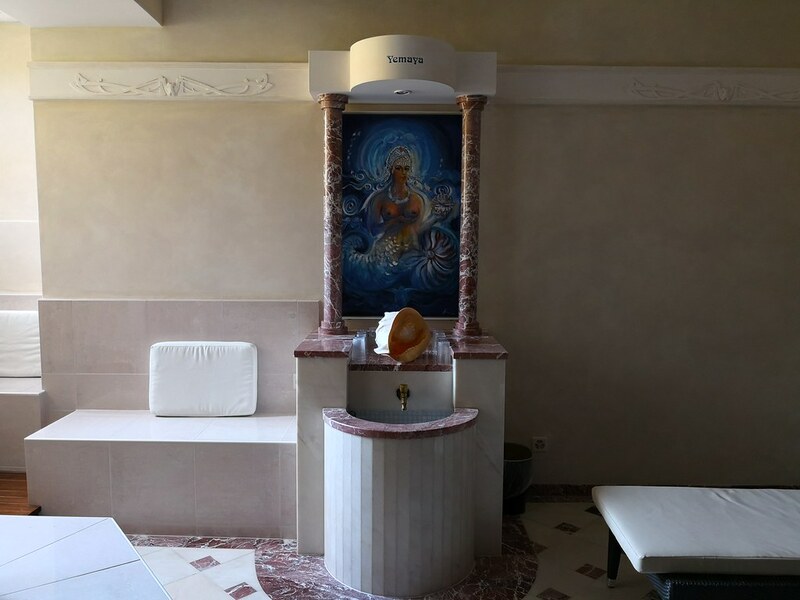 Due to the low season, the Yemaya spa in the hotel was closed but it does have the usual steam room and sauna room with 3 distinct areas, being a Finnish style hot sauna room, an aromatic grotto room, and a common Turkish steam bath. The spa is located at the lowest floor in the hotel, which is one floor beneath the restaurant and 2 floors below the lobby. Aside from the restaurant in the lower level, there is a smaller casual bar on the lobby floor. This space is popular in the evening as a place for guests to unwind even during the low season. 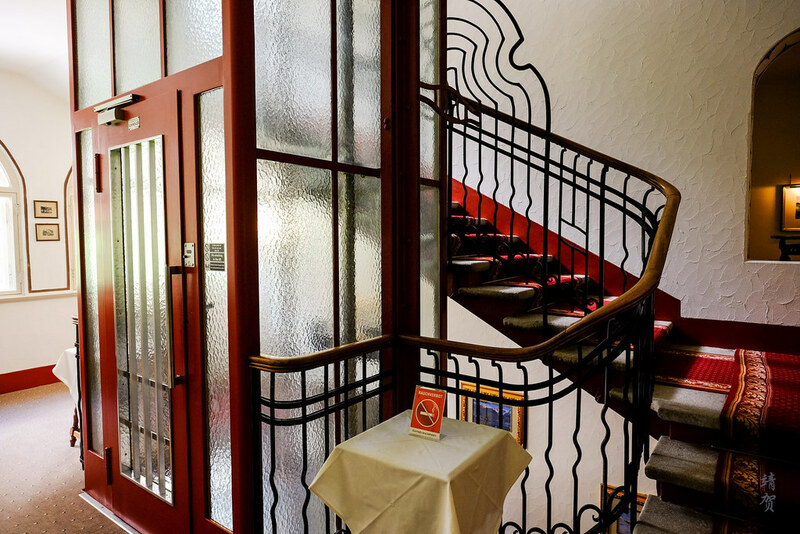 Adjoining the breakfast restaurant, there is another restaurant called Caprice that opens for dinner. Inside there are more intimate seating, most by the window with a view of the lake. There is even a more private dining area for romantic occassions. 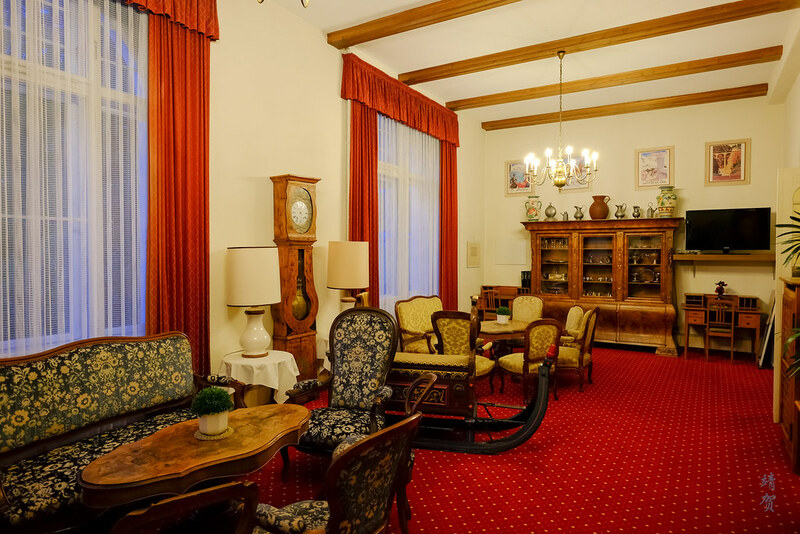 On the same floor, there is a lounge which has several sofas, and filled with numerous antiques in the room. This large space was brightly lit but it was empty, giving it a quiet ambience suitable to read a book. 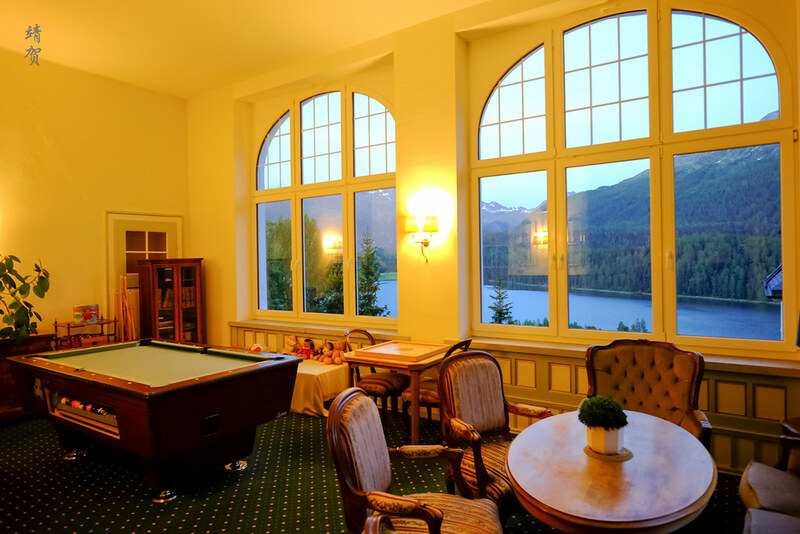 Adjoining this lounge is another room that is smaller but contains a pool table and several kids’ toys and even has a kid-sized foosball table. There is a table setup for board games as well. A one night stay at this hotel costs about CHF200 (~$195) which is somewhat expensive considering the old state of the facilities and the really average breakfast. 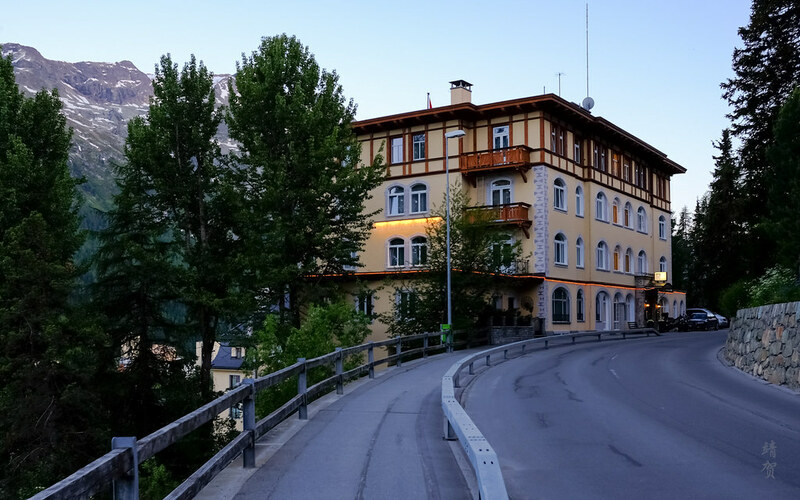 Due to the small spa and the slightly off location from the ski lifts without any bus routes passing through the hotel, it does not have the best location either. Unless there was no other alternative, it is unlikely I would return to this hotel. In fact I would even be more glad to pay a bit more and stay slightly farther at the Nira Alpina in Corvatsch, which I have reviewed before.